Ants are attracted to rose bushes because of another pest that has already taken up residence in the garden, the aphid. Ants love to feed on the sticky, honeydew residue left on the plants by aphids. Ants protect aphids from predators and store aphid eggs in their nests over the winter. Then they carry the aphid eggs back to the garden in the spring. 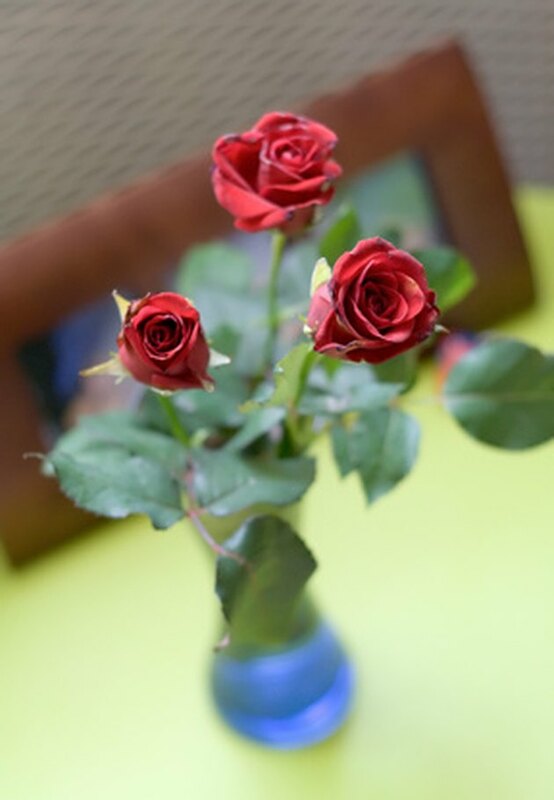 Ants do not cause any physical damage to rose bushes. Aphids, however, can do considerable damage to the rose bush and flower. 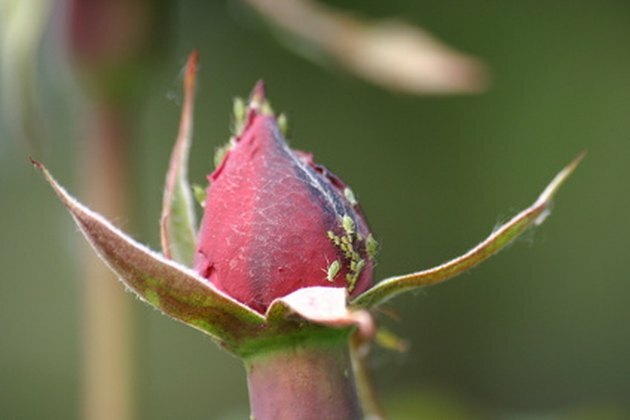 To keep ants away from rose bushes, it is necessary to first control the aphids. Aphids on a Tender Rose Bud. Aphids, also known as plant lice, are very small plant-eating insects with a fat pear-shaped body. They can commonly be found on rose bushes in almost every climate. There are many natural methods to control aphids on rose bushes. Inspect the underside of the plant leaves, beginning in the spring. Hosing the rose bush down with a good spray of water will knock the aphids off the plant, but ants are known to carry them back to the rose bush. If the leaves are heavily infested, prune rose bush and dispose of infected branches. Insecticide soaps made with Neem oil is a chemical-free option to treat aphids. To rid roses of aphids, a chemical spray containing pyrethrin is effective, but will also kill the beneficial insects in the garden. Growing companion plants in the garden will attract beneficial insects that feed on aphids. A few plants that are highly effective are white sweet clover, hyssop, spearmint, Queen Anne's lace and sunflowers. Ladybugs are beneficial in the garden. Natural enemies in the garden that love to feed on the aphids include ladybugs, parasitic wasps, lacewings and praying mantis. 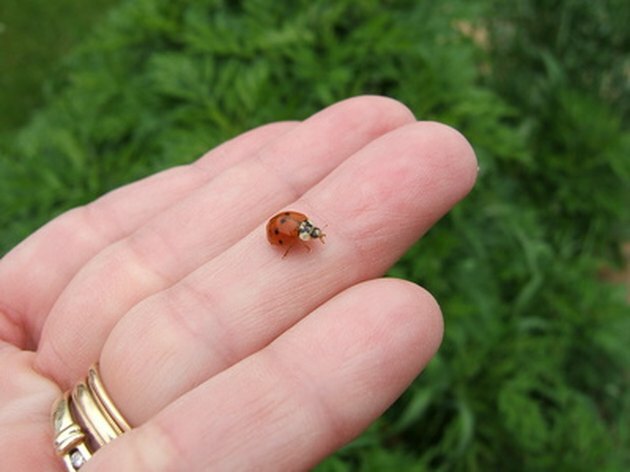 If there are not many ladybugs in the garden, they can be purchased at your local garden center. Water the garden during the day, then release the ladybugs near the rose bushes during the evening hours. This will encourage them to stay in your garden. Once the aphids are eliminated, then the ants can be dealt with. 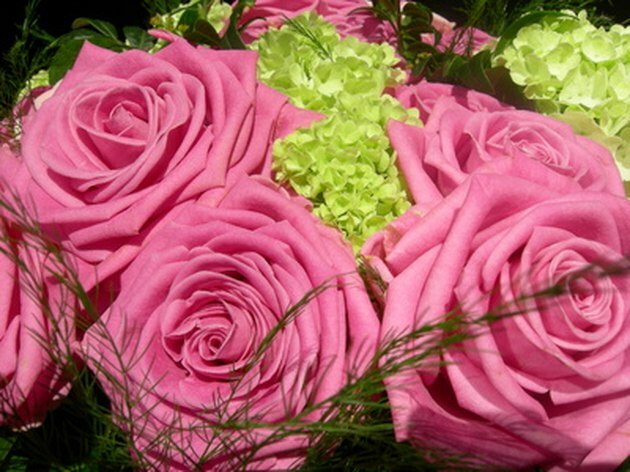 Enjoy a bouquet of healthy roses. Since aphids do not like potassium, banana peels placed at the bottom of the rose bush will deter the pests.There are several kitchen ingredients to keep ants away from rose bushes, such as baking soda, flour and baby powder. Sprinkle around the rose bushes and ants will not cross over. However, to totally rid the garden of ants, pour coffee grounds directly on the anthill. They will eat the coffee grounds and implode. Sprinkle grits or cream of wheat around the rose bushes. Ants will eat it, drink water and the grain will expand and kill them. Mix one part vinegar with one part water and spray around plants. The acid in vinegar will kill ants. A love of reading has naturally led Joy Granger to a love of writing. With past experiences of ghostwriting for others through newsletter articles and inspirational writings, her goal in writing is the publication of her own book.